Greg Linington is a lecturer in Constitutional Law in the Department of Political and Administrative Studies at the University of Zimbabwe. ABSTRACT: Zimbabwe's 2013 elections were tainted with illegality. This article focuses on two constitutional issues: the election date controversy and the use of the Presidential Powers (Temporary) Measures Act to effect amendments to the Electoral Act. It is argued that the language of the Constitution was not followed. An artificial interpretation of the relevant constitutional provisions undermined the rule of law and the separation of powers. This is disturbing, since the meaning of the constitutional provisions concerned is not obscure. The article also describes some of the �structures' under which the election was conducted. The powers and composition of the Zimbabwe Electoral Commission, the impact of proportional representation on the legislature and the rules governing the election of the president are therefore outlined and explained. ABSTRACT: The 2013 harmonised elections held in Zimbabwe after the termination of the SADC- facilitated Government of National Unity elicited unprecedented comment following another resounding �win' by the Zimbabwe African National Union-Patriotic Front (Zanu-PF). This article reflects on the election and argues that while competitive authoritarianism contributed significantly to the party's �landslide victory', it is slipshod to ignore the centrality to its electoral success of Zanu-PF's populist stance with respect to land, indigenisation and empowerment. The article also examines the significance of hate speech as a negative campaign strategy employed by Zanu-PF to portray the main opposition party, the Movement for Democratic Change (MDC) in the most negative light. It concludes that the election was reduced to �fantasies of salvation' by President Robert Mugabe as a charismatic leader, primarily because the electorate was seduced into viewing Zanu-PF as the most credible party to pull the country out of the economic quagmire through its land, indigenisation, empowerment, �pro-poor' and anti-Western policies. These policies resonated well with the growing numbers of wage-less youthful voters,1 who constitute more than 60% of the country's population. Obert Hodzi is a PhD candidate in the Department of Political Science, Lingnan University, Hong Kong. ABSTRACT: The youth in Zimbabwe have often been described as disenfranchised, corruptible and susceptible to manipulation by politicians. This narrative assumes that the youth are a homogenous group, uniform in their grievances and consensual about strategies to resolve them. Analysing the case of youth participation in the 2013 harmonised elections in Zimbabwe, this article challenges that assumption by arguing that the youth are polarised and struggling to articulate a national objective that might be able to shift the country's political discourse. It contends that the majority of Zimbabwean youth act as loosely affiliated individuals seeking personal rather than group benefits. At the same time, by assessing the engagement of youth within political parties either as supporters or officials, the article further argues that the structural dynamics of these political parties deny the youth agency and make them conform. It therefore concludes that participation by the youth in the 2013 elections was mainly driven by individual interests rather than collective grievances or political identity. Tamuka Charles Chirimambowa studied Political Science at the University of South Africa, Economic History at the University of KwaZulu-Natal and International Relations at the University of Zimbabwe. He has extensive experience working in Zimbabwe's civil society. Tinashe Lukas Chimedza, a former Secretary General of the Zimbabwe National Students Union, studied Social Inquiry at University of Technology Sydney (UTS). He is interested in development studies and political change in Africa. ABSTRACT: This article is a critical and historical assessment of the contribution of Zimbabwe's bourgeoning civil society to the restructuring of political and social relations in post-colonial Zimbabwe. The general objective is to contribute to the debate about how Zimbabwe's post-colonial civil society has theorised about change and, importantly, the deeply contested nature of the agency that this has generated. The article concentrates on how civil society structured itself and acted before the elections on 31 July 2013, which the ruling Zimbabwe African National Union-Patriotic Front (Zanu-PF) �won resoundingly'. What emerges is that while the economic despair of the 1990s and the breakdown in the national consensus mobilised an almost �popular democratic front' this changed course in the subsequent decade, weakening the �popular' and �democratic' nature of civil society agency. The foundation of �liberal rights' and �democracy' and �good governance' powerfully amalgamated in the National Constitutional Assembly (NCA)and the �No Vote' in 2000 became theoretically feeble and revealed a debilitating post-colonial impasse - an interregnum during which an urban-based intelligentsia-led theorisation and agency was momentarily checkmated by a violent nationalist authoritarianism. ABSTRACT: A year after Zimbabwe's July 2013 elections some are still mystified by the results, especially the overwhelming triumph of incumbent President Robert Mugabe and his Zimbabwe African National Union-Patriotic Front (Zanu-PF). The outcome seemed to go against the grain. Zanu-PF achieved a supermajority, capturing more than two-thirds of the parliamentary seats. Its chief rival, the Morgan Tsvangirai-led Movement for Democratic Change (MDC-T) only offered feeble competition and was left befuddled, wondering what had hit it. To date, few know what exactly happened to the opposition forces and their �pro-democracy' allies in civil society and how it happened. However, there is anecdotal and circumstantial evidence that can be used to deduce what might have taken place. This article seeks to do that. ABSTRACT: In the aftermath of the conclusion of the peace process in Angola in 1992 the Angolan government managed to establish formal democratic institutions. Foremost on the agenda was the decision to allow for multiparty elections. Yet the launch of electoral politics as part of the democratic landscape in Angola has not led to the development of a culture of tolerance and openness typical of democratic societies. On the contrary, the outbreak of a civil war following the disputed elections in 1992 gave the Angolan government the opportunity to revert to its authoritarian ways. The consequence of this reversal was that the elections of 2008 have not led to the entrenchment or the development of electoral democracy but rather to the reinforcement of electoral authoritarianism. This article posits that while the foundation for the evolution of electoral democracy has been laid, the Angolan government can, at best, be described as an electoral authoritarian state that reinforces its hegemony over Angolan society through electoral processes which do not conform to democratic practices. ABSTRACT: Since Nigeria's return to democratic rule in 1999 elections in the country have been accompanied by reports of widespread fraud. A number of studies have illustrated the many ways in which electoral fraud is perpetrated in Nigeria. However, there is yet to be a serious study showing the judicial dimension to such fraud. This study reveals the relationship of the judiciary to electoral fraud. Analysing data sourced from written records (newspaper reports, election observers' reports, law reports and political party publications) and interviews, the study argues that the structure and condition of the Nigerian judiciary can help to explain the incidence of electoral fraud in the country. It also makes a new contribution to the existing literature on the nature and causes of electoral fraud, showing that non-electoral institutions, especially the judiciary, and non-political elites can be relevant to the explanation of electoral fraud in a country. ABSTRACT: It is often assumed that Kenyans vote on the basis of ethnic identification rather than the socio-economic and political issues affecting their lives. However, experience from earlier elections shows that issues and interests are important drivers in giving form and expression to identity politics. This article examines the interaction between ethnic identification and issue differentiation in the March 2013 general elections in Western Kenya by identifying factors that influenced the outcomes in the six simultaneous elections. The article is based on observation, interviews and data collected in a survey of four constituencies inhabited by Luo- and Luyia-speaking people in Western Kenya during the campaign period and immediately after the elections. The study suggests that while constituencies may have voted as a bloc along ethnic identification lines - especially with respect to national politics and the presidential election - their choices were also differentiated and informed by specific issues, especially at the county and constituency levels. ABSTRACT: This article sets out to analyse the role and impact of monetary power in Kenya's presidential elections. It examines the economic advantages or lack thereof which each of the candidates marshalled to fight the elections and the extent to which the economic edge determined the final outcome. The article focuses on the five presidential elections Kenya has held since its first multiparty dispensation. 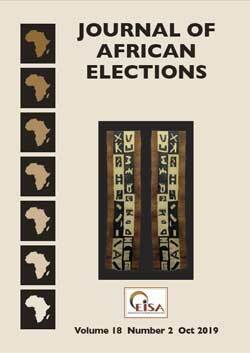 The analysis traces the consistency of trends and the presence, or absence, of patterns in an attempt to draw generalisations and parallels, and demonstrates how economic wealth has been used by Kenyan presidential candidates since 1992 to influence and win elections. The article contributes to a comprehensive understanding of the conceptual, legal and practical development of the role of money in supporting and/or discrediting presidential electoral processes and outcomes in Kenya.